Take control of your home accounting! Accounting from home can be a difficult task—but not an impossible one with the right tools. Home Accountz For Dummies shows you exactly how to use the UK's number one home finance software to look after household expenditures and effectively budget for a positive future. Author Quentin Pain shows you the ins and outs of managing your money with Home Accountz and this easy-to-understand book provides you with the tools you need to predict future financial capabilities. 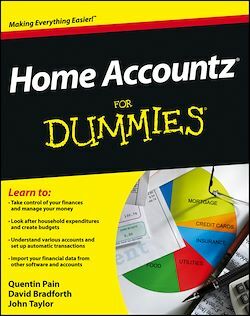 Home Accountz For Dummies is a fun, easy to use guide that takes the chore out of home accounting and puts you in control of your money.